This paper pays much emphasis on the relationship between economic growth and international trade in South Korea. Via using the ordinary least square to perform an empirical analysis, Findings illustrate that the long-run, steady and equilibrium relationship among economic growth, import trade and export trade exists. And the empirical analysis results reveal that an increase in the economic growth will result in an increase in the import trade and export trade in South Korea. More importantly, the export-oriented economy has a very significant effect on economic growth. Also, the import trade not only promotes the economic growth but also promotes the export trade. As a matter of fact, the main purpose of this paper is to make relationship between economic growth and international trade clear for the policy-makers to take good measures when the economy falls into a recession such as global economic crisis in 2008. Keyword: Economic Growth, Export Trade, Import Trade, Ordinary Least Square. With the development of economic globalization, the international trade and economic exchange, as well as economic and technological cooperation among nations are becoming more and more frequent.The international trade is regarded as bridge to connect with each country, and it also plays a vital role in promoting the economic growth of them. In the whole Asia, Korea is an important indicator to guide the economic development in Asia, especially, Since the early nineteen-eighties. Up to today, many scholars own Korea’s economic success to its full use of the export-oriented economy. As a matter of fact, the study on the economic growth and the export-import trade in Korea just stays in the economic theory analysis. However, there are few empirical analysis on this heated issue. Therefore, this paper will explore the relationship between economic growth and export-import trade in Korea in terms of empirical analysis. At present, there are three kinds of common views that are optimism of trade, pessimism of trade and eclecticism of trade in the economic academic circles at home and abroad on the economic growth and international trade. The purpose of this paper is to discuss the relationship between economic growth and export-import trade in Korea in terms of the optimism of trade. More importantly, this paper not only verifies the relationship between economic growth and export-import trade in the economy theory but also testifies this relationship in empirical analysis. In order to get a more precise consequence, an ordinary least square(OLS) will be applied to perform a linear regression. To this end, this paper is organized into five section. Following this introduction is section 2, which focuses on literature review. Section 3 discusses the theoretical foundation. Section 4 provides the empirical analysis, while section 5 summaries the findings. There has been growing theoretical analysis on the relationships between trade and economic growth in many developed nations, such relationships have not been proven empirically in developing nations. Chatterji, Mohan and Dastider (2013) finds that there is not a cause and effect on the relationship between trade and growth, because as economics grow, they trade more and become more open. Furthermore, Matthew(2014) figures that relaxing foreign exchange controls may increase investment opportunities. These increases in investment result in new technologies that can promote a country’s economic growth.. This kind of investment opportunities can be furthered by creating trade opportunities and an environment that can attract multinational co-operations. But benefits from trade depend on the production, nature and characteristics of goods that a country produces and trades. The domestic economic policies are pursed and the trade regime is adopted. The static and dynamic get from trade arise from comparative advantage theory and the effects of trade on the level of investment, and on the state of technical knowledge. Chen (2009) finds that the international trade can facilitate the economic growth through technology spill over and external stimulation. The export trade is a significant source of income and an engine of economic growth, so a successful export trade drive stimulates a positive multiplier effect on the economy with import feedback effects. Ajmia, Ayeb, Balcilarc and Guptad (2013) finds a co-integrating relationship between two-way and unidirectional causality from GDP to exports through verifying for causality between exports and economic growth in South African conducting linear and non-linear tests. conclusions are obtained that exports can improve growth in GDP by increasing employment not incomes in the export sector as well as technological development. The import trade is also intricately linked to economic growth even though there are two competing effects on the demand and supply side. As for the demand side, import trade is treated as a linkage and constrain economic growth. However, the import constraints are eased with trade liberalization coupled with efficiency gains on the supply side. Mishra (2012) figures that empirical analysis on the nexus between imports and economic growth is rather mixed and inconclusive. If an increase in GDP is always the source of finance for imports then they can constrain growth and can have a negative impact on economic growth. An increase in imports also causes the import substituting domestic market to shrink, so decreasing investment and ultimately productivity. An increase in the capital stock available for an economy results in the economy attaining a high growth path in the future through capital accumulation and increase in production capacity of the economy. The current research also considers international trade as an explanatory variable in the analysis with other macroeconomic variables. Chude and Chude (2013) claim that government expenditure has an important role to play in the determination of international trade and economic growth for Asian countries. This derives from the Keynesian view where government expenditure is used as an instrument to stimulate aggregate demand and hence promote economic growth. However, an unsustainable high level of government expenditure may exceed the fiscal revenue leading to a budget deficit. Checherita and Rother (2010) argue that a high level of government budget deficit, and ultimately public debt has negative growth effects on the international trade and the economy. A stable macroeconomic environment signified by low and stable inflation plays an important role in determining growth of an economy and promotion of international trade. Curwin and Mahutga (2014) argues that the inflation imposes negative externalities on the economy as it affects an economy’s efficiency, leads to uncertainty and affects future profitability of investment projects. According to Chen (2009) taking the foreign trade and other factors as independent variables to explore the relationship quantitatively between the two cannot only explain the relationship accurately, but also make the affecting extent of independent variables on dependent variables clear. As the economic globalization deepens, the linkage among countries turns closer than that of before. However, the foreign trade plays a vital role in promoting the international economic exchange and cooperation. In this paper, South Korea is set as an example to analyze the relationship between economic growth and foreign trade. Also, this paper applies the analysis of South Korean economic growth to the foreign-trade dependence and the export-import elasticity. In advance, the economic growth and the international trade in Korea should be well-understood. Fig.1 indicates that in general there is a continuous increasing trend in the economic growth, total export-import, export and import from quarter 1 in 2000 to quarter 4 in 2016 except 2008. In the past 16 years, the GDP in Korea has increased from 200.4861 billion dollar in the first quarter of 2000 to nearly 380.2449 billion dollar in the forth quarter of 2016, which growth rate is approximately 89.67%; The total export-import has also increased from 72.2 billion dollar to 221.8billion dollar in the same period, which growth rate is nearly 206%; Similarly the import has a great change from 35.4 billion dollar in the first quarter of 2000 to 118.2 billion dollar in the forth quarter of 2016, which growth rate is up to 234%; The export has increased from 36.8 in the first quarter of 2000 to 103.6 billion dollar in the forth quarter of 2016, which growth rate is up to 182%. From Fig.1, conclusions can be come into that: In general, the movement of GDP and total export-import keep the same direction; Due to the global economy crisis in 2008, all of them have a big fall; Starting at 2016, the total export-import, export and import have a significant falling trend because of the deployment of Sade in Korea. The trade-to-GDP ratio is an indicator of relative importance of international trade in the economy of a country. It is calculated by dividing the aggregate value of imports and exports over a period by the gross domestic product for the same period. Although called a ratio, it is usually expressed as a percentage. It is used as a measure of the openness of a country to international trade, and so may also be called the trade openness ratio. It may be seen as an indicator of the degree of globalization of an economy. Similarly, when measuring the development of economy and foreign trade in Korea, the trade openness ratio is also a better standard except the GDP, the amount of foreign trade, the amount of export and the amount of import. In general, the bigger of trade openness ratio demonstrates the economy operation will face with more external risks; Conversely, the smaller of it indicates that the foreign trade has little effect on promoting the development of economy. Fig.2 shows that the trade openness ratio in Korea locates in a high position from 2000 to 2016. and after the forth quarter of 2005, it has been more than 50%. Also, the export openness ratio and import openness ratio pose in a relative high position. General speaking, even though the trade openness ratio is under fluctuation, it still keep a increasing tread. When the global economy crisis in 2008 and the deployment of Sade in Korea in 2016, its trade openness ratio does not fall but rise up. Meanwhile, the global economy crisis in 2008 result in an increase in the export openness ratio and import openness ratio, which leads to an increase in the trade openness ratio; The deployment of Sade in 2006 also results in an increase in the export openness ratio and import openness ratio, which leads to an increase in the trade openness ratio. In micro-economy theory, the elastic coefficient index is also a way to measure a reaction of GDP to the change of amount of export and import trade except the trade openness ratio. So, the elastic coefficient of GDP to export and import trade is introduced in this paper. the elastic coefficient of GDP to export and import trade indicates when the growth rate of export trade or import trade increase by 1%, how much the GDP will be changed. Its absolute value will directly demonstrate the influence of the export trade and import trade to GDP. If elastic coefficient is greater than 1, it means that the export trade or import trade will have a great effect on promoting the economic growth. Oppositely, if the elastic coefficient is less than 1, it means that the export trade or import trade will have little effect on promoting the economic growth. Fig.3 shows that from the first quarter of 2000 to the forth quarter of 2016, the GDP growth rate in Korea is always positive except the forth quarter of 2000, the first quarter of 2003 and the forth quarter of 2008. More importantly, the global economic crisis which occurs in 2008 has a greatest effect on the growth rate of Korea’s GDP. Meanwhile, Fig.3 also indicates that the elastic coefficient of import trade is more relative steady than that of export trade. Whatever the elastic coefficient of export trade or the elastic coefficient of import trade is, there are some periods of their elastic coefficient jumping +1 or –1. Especially, the elastic coefficient of export trade is up to 4.9 in the third quarter of 2010 and is up to –4.1 in the first quarter of 2013; The elastic coefficient of import trade is up to 3.0 in the forth quarter of 2000 and is up to –2.6 in the third quarter of 2016. Table.2 directly shows that the import trade has a greater effect on the growth of GDP in Korea when compared with that of export trade. 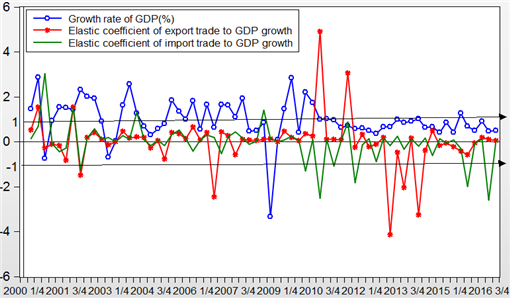 Namely, the import trade has a high correlation with GDP growth in Korea. Table.2 also strongly verifies that the relationship between the GDP growth and export and import trade is obviously linear and whose coefficients are approximately 0.9. It means that the export and import trade has a significant effect on GDP growth. Note:is a constant,,are the coefficients of export and import andis the stochastic error term. Because the function is the logarithmic form, the coefficients stand for the elastic coefficient. Time trend has a significant effect on its long-run development whatever in the economic field or trade field, which can make it produce a time effect. Because its effect, most economic data shows non-stationary in a period. As time goes by, it will fluctuate fiercely. When preforming an empirical analysis, using the raw data will be easy to result in a spurious regression, which can make variables that has no steady relationship or no theoretical correlation generate a causal relationship on some numerical value. However, this kind of causal relationship which is produced by time trend can not guarantee the real relationship among variables. So, the function to forecast will be lost. Moreover, co-integration and Granger Casuality test are also based on stationary test. Therefore, when applied the time series sequence, taking the logarithm or difference can be conducted to remove the unit root first, which can make the sequence become stationary. This paper will use the ADF test to test the stationary of and as well as . The results will be shown in table.3. Table.3 present the summary of unit root tests results at both level and first difference. The ADF tests are conducted on all variables, and as well as constant at 5% level of significance. As the variables are found to be stationary, it implies that they are co-integrated. In other words, the result implies that the joint probability distribution of these variables do not change when shifted in time, as such, the mean and variance, if present, are also expected not to change over time. Table.4 shows regression results whose. Namely, and can explain the 92.6% of ;P=0.000 means that the entire equation gets through significance test; D.W.=0.617 means sequences do not exist auto-correlation. Also, As the regression coefficients show: If the export in Korea increases by 1%, its GDP will increase by 0.375%; If the import increases by 1%, its GDP will increase by 0.758%. In short, it means that the growth of GDP has a positive effect on the export and import growth in Korea. Next, the residual sequence of the linear regression will be conducted a ADF test. the results show in table.5. Table.6 shows the hypothesis thatdoes not Granger Cause and does not Granger Cause are rejected. It means that two-way causality between the export trade end economic growth exists under 10% significance level. Moreover, the conclusion that does not Granger Cause is rejected is in accordance with co-integration relation results. It indicates the fact that whenever in the short run or in the long run the export trade can promote the economic growth in Korea is significant. Also, this results verify that the export-oriented economy and outward-looking economy have been carried out in Korea. Taking the short-run relationship between the economic growth and import trade into account, two-way causality between the import trade end economic growth exists under 5% significance level. Namely, the import trade and the economic growth have mutual promoted effects. And Granger causality test result is in keeping with the co-integration relation test result. It also indicates that whenever in the short run or in the long run the import trade can promote the economic growth in Korea. Otherwise, in general economic theory, the import trade prevents the economic growth. But in Korea, the import trade promotes the economic growth. This view conforms to optimists’ views in trade. Namely, whatever the export trade or import trade, they can promote the domestic economic growth. In addition, table.6 also implies that there is a long-run equilibrium relationship between import trade and export trade, and a unidirectional causality from export trade to import trade. The hypothesis that does not Granger Cause is non-rejected and does not Granger Cause is rejected under 10% significance level. It demonstrates that the import trade not only promotes the economic growth but also promotes the export trade in Korea. The reason is that it relevant with the domestic resource shortage and raw material importing structure in Korea. This paper mainly focuses on the relationship between the economic growth and trade balance in Korea in terms theoretical analysis and econometric analysis. the principal findings is that: the long-run and equilibrium relationship among economic growth, export trade and import trade exists. in the short run, two-way causality between the export trade end economic growth exists. It means that whenever in the long run or in the short run, the export trade still has a positive effect on economic growth; Also, two-way causality between the import trade end economic growth still exists. Namely, the import trade and the economic growth have mutual promoted effects; A unidirectional causality from export trade to import trade illustrates that the export trade can promote the import trade. Ajmi, A. N., Aye, G. C., Balcilar, M., & Gupta, R. (2015). Causality between exports and economic growth in South Africa: Evidence from linear and nonlinear tests. The Journal of developing areas, 49(2), 163-181. Chatterji, M., Mohan, S., & Dastidiar, S. G. (2014). Relationship between trade openness and economic growth of India: a time series analysis. Journal of Academic Research in Economics, 6(1), 45-69. Checherita-Westphal, C., & Rother, P. (2012). The impact of high government debt on economic growth and its channels: An empirical investigation for the euro area. European Economic Review, 56(7), 1392-1405. Chen, H. (2009). A literature review on the relationship between foreign trade and economic growth. International Journal of Economics and Finance, 1(1), 127. Chude, N. P., & Chude, D. I. (2013). Impact of government expenditure on economic growth in Nigeria. International journal of business and management review, 1(4), 64-71. Curwin, K. D., & Mahutga, M. C. (2014). Foreign direct investment and economic growth: New evidence from post-socialist transition countries. Social Forces, 92(3), 1159-1187. Gries, T., & Redlin, M. (2012). Trade Openness and Economic Growth: A PanelCausalityAnalysis.Source:http://faculty.washington.edu/karyiu/confer/sea12/papers/SG12-112%20Redlin.pdf Accessed 10 April 2014. Lee, C. T., & Huang, D. S. (2014). Human capital distribution, growth and trade. Bulletin of Economic Research, 66(1), 45-54. Matthew, O. H., & Johnson, A. (2014). An Investigation of the Impact of Foreign Direct Investment on Economic Growth in Nigeria: A Rigorous Approach. Journal of Poverty, Investment and Development, 3, 33-41. Mishra, P. K. (2012). The dynamics of the relationship between imports and economic growth in India. South Asian Journal of Macroeconomics and Public Finance, 1(1), 57-79. Slacik, T., Steiner, K., & Wörz, J. (2014). Can Trade Partners Help Better FORCEE the Future? Impact of Trade Linkages on Economic Growth Forecasts in Selected CESEE Countries.